Peru's marriage rate is comparatively low, something that's caught the attention of local officials. In order to turn it around, which officials have linked with improving local infrastructure and the local economy, officials are throwing mass wedding ceremonies and inviting long-time couples to attend. The Peruvian economy is booming and people are migrating from the countryside to the city of Lima, which is becoming more and more developed. But it's still infamous for being a place where a lot of things depend on informal agreements. And that applies to everything from commerce and real estate deals — to relationships. 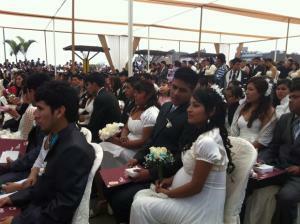 Peru actually has one of the lowest marriage rates in the region. But that's starting to change. City officials are pushing marriage, because they believe it helps couples be more stable, which they say means a more stable society. And now, local governments aren't just encouraging couples to get married, they're sponsoring big mass weddings: Group ceremonies where hundreds of couples get married, all at once. On a windy Saturday, just outside the mayor's office in the San Juan de Miraflores neighborhood. There's a tent set up, made of cream and gold fabric. There are rows of plastic chairs facing a small stage. A DJ is warming up with a little Whitney Houston. Over the course of an hour, 169 couples trickle in. The men wear standard, dark suits. Some of the women wear white princess gowns, with huge petticoats, corsets and elaborate veils. Some wear simple, loose frocks. A few: tight mini-dresses. Others, wool pantsuits. The couples give their number to a city employee. In return, they get a marriage license and a little white box with a single piece of wedding cake inside. Most of these couples have lived together for a long time. Yanet Carillo and Carlos Marquina, have been together 20 years — and they have five daughters. But because the local government was promoting mass weddings, they decided to get married now. "This is to formalize things in our home a bit, you know?" Carillo said. "To set an example. How could I tell my daughters to get married if they're going to say to me, 'Mom you're not married.'" Like many here, they're from the countryside, where commitment often means simply living together. But recently they realized they'd been missing out on some of the practical benefits of marriage, like joint ownership of their home, shared pensions, and shared legal responsibility for their kids. This is exactly why municipal governments in fledgling neighborhoods like San Juan de Miraflores want residents to get married. The ceremony for Carillo, Marquina and the rest of the couples starts with a local youth orchestra taking the stage. It then moves into a number from Swan Lake by a local ballet troupe. And then Mayor Adolfo Campos speaks. But he's not talking about love, he's talking about public works projects. Stuff like paving nearby roads. Then, Campos talks about the kids playing music, and learning ballet. According to Campos, all of this — the road work, the kids playing violin and dancing ballet, and the couples getting married — is part of the same thing: Making San Juan de Miraflores a better, more orderly place to live. Finally, it's time for the vows. The mayor tells the men to take the hand of their betrothed. Campos asks if each man takes the woman they're holding by the hand to be his wife ... and the guys all yell, "Yes!" The women have their turn, too, though the mayor makes them do it twice, because he says they weren't yelling "yes" loud enough. Then, before the couples head out to family parties and celebrations, there's a kissing contest, for the, "longest and most passionate kiss." It's easy to see why this makes sense — for one thing, it's a lot cheaper than a traditional wedding. But for many people in the U.S., the idea of sharing a wedding with a bunch of other people would seem weird. "In the Andean world, everything is community-based," Ccopa said. "All of it's collective. Building a house: ayni. Planting crops: ayni. It's all collectively done. And everything that you see here in the city, it depends on collective work. So for us, there's nothing strange about getting married in a mass wedding. Quite the opposite." Marquina and Carillo say that's right. And Carillo adds that, even though they're here with a bunch of people they don't know and they've already had kids and lived together for 20 years, getting married feels special. When you love someone, she says, everything is exciting, at whatever moment. PRI's The World is a one-hour, weekday radio news magazine offering a mix of news, features, interviews, and music from around the globe. "The World" is a co-production of the BBC World Service, PRI and WGBH Boston. More about The World.